Milan, Italy – Before the game, fans flock to the pitch with megaphones, drums and firecrackers. Tops off. Onlookers are baffled. It’s Saturday afternoon at a football pitch on Milan’s outskirts among council houses, containers and construction sites. But today’s match is about more than just football. 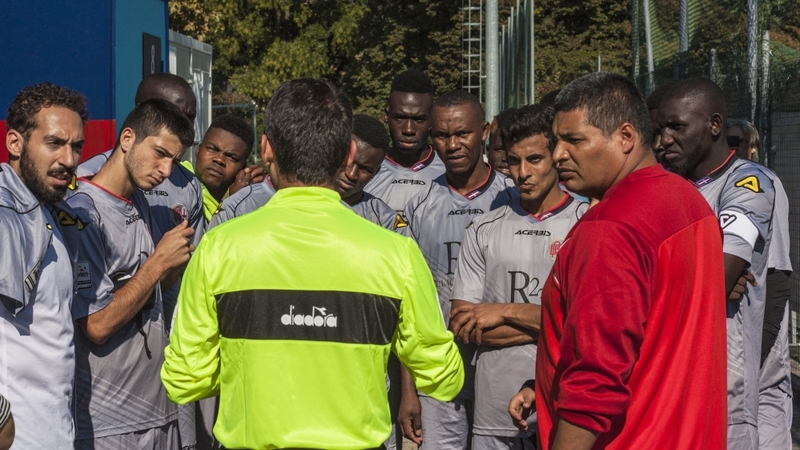 One side, St. Ambroeus FC, is one of Italy’s first competitive football teams founded by asylum seekers. Most players are young West Africans – the average age is 22. They are Muslim and Christian, speak French, English, Arabic, Fula, and Italian, and live clumped together in refugee centres. Many have come through the notoriously difficult Libyan route. Kalilou Koteh, a midfielder and the captain, says nine in 10 players had painful experiences. Koteh is reportedly the first African president of an Italian competitive club, but the title doesn’t seem to mean much to him. “Yes, I was told,” he says, smiling. A 24-year-old Gambian, he’s just lost his job as a kitchen assistant and like others on the team, he might soon lose his visa, too. He has leave to remain “for humanitarian reasons”, an alternative protection status to that of refugee that has just been scrapped by interior minister Matteo Salvini‘s new security decree. Hostility to migrants has recently increased in Italy, where the far right has blamed a sluggish economy on an influx of asylum seekers. The football team has faced some abuse, especially online. One Facebook user even suggested they played water polo instead, a reference to drownings in the Mediterranean. Amid the hostility, St. Ambroeus FC has become a precious space for integration. In the first half, St. Ambroeus FC’s right-mid controls a ball cleared by the defence and strikes a stunning shot toward the bottom-left corner. The opposing keeper can’t save it: it’s 1-0. At least on the pitch, the experiment seems to work. It’s not the first project of this kind in Italy: refugee-led teams sprung up soon after the asylum seekers arrived. “There are at least 250 clubs today,” says Aniello Luciano, an Italian journalist who produced “Nobody Offside“, a documentary on the topic. Formats vary. Most are amateur teams. Some are refugees-only, others are mixed. In Naples, Afro-Napoli United features Neapolitans and Africans. In Rome, Atletico Diritti unites migrants, Italians and inmates. Their potential for social change, and for football, is untapped. Afro-Napoli United enjoys some sporting success, while many players have integrated, settled down and married Italians. Italians have joined in St. Ambroeus FC too, and some help run it. The team was born when six teams of Milan’s refugee centres united. The first ideas for a name evoked racial justice battles, such as Black Panthers FC and Thomas Sankara FC – a reference to the Burkinabe revolutionary nicknamed “Africa’s Che Guevara”. The final name, St. Ambroeus, is the Milanese dialect version of Saint Ambrose, the patron saint, as well as an homage to Hamburg’s cult St Pauli FC, which is active in terms of charity and attracts left-leaning fans. The logo features a pigeon – a bird which is frequently seen in Milan’s centre, and references migratory patterns. A couple of minutes into the second half, the opposing right-wing starts testing St. Ambroeus FC’s left-back, and here comes a goal. And another one. 1-2. Organisers and volunteers for the club complain it has taken over a month for the Italian football federation to run checks on players. Only about 15 are cleared to play today. The others, including president Koteh, must wait. It still feels like a blessing: the team postponed the previous two matches because only eight players were cleared then. Then there are those who never quite make it. Roberta De Palo, one of the St. Ambroeus FC’s directors, says one player started “making wrong friendships”. In one game, he passed out on the pitch while convulsing. At the hospital he got better, but never showed up to practice again. They remind me of myself when I was young. I was so poor I couldn’t afford goalkeeping gloves. A friend sewed a pair, carving them out of second-hand jeans. The episode highlights the role of staff: they are more than coaches, friends and administrators – they are educators and strive to keep people off the wrong path. Manager Luis Patino, for example, enforces strict discipline – he warns he will expel anyone who misses Italian language class. He became a professional footballer and played in Peru’s second division. Now, he hopes football can offer his players the same chances. St. Ambroeus FC equalises: 2-2. Fans cheer but the atmosphere is unique: tragedy mixed with boyish enthusiasm. An Italian player recommends following the club for the whole season. “There’s a real chance we get promoted,” he said. But organisers looked worried. “With the new anti-immigration decree, we’ll be lucky if we have enough players when the season ends,” one said. Koteh says he’s not worried about his visa, that he’ll cope. Patino says his only goal is the players’ wellbeing. “Happiness is only a football away,” he said. Towards the end of the game, with the score tied 2-2, the only Italian player on the pitch gambles too much and takes down an opponent. Off he walks, head down, leaving his African teammates 10 vs 11. They try to press ahead, but shortly before the end, opponents find an opening on the right, in comes a cross – and the ball is in: 2-3. Soon, the referee calls it a game. One could argue winning isn’t the most important thing for teams like St. Ambroeus FC; what they accomplish off the pitch is more valuable. But players look down as they head to the locker room – they’re disappointed. On their home pitch, it would have been nice to win.